Oh Christmas ... When I was a kid it was truly the happiest time of the year for me. Being the youngest in the family, I was the center of the family's attention in every way. Back then I could truly feel that Christmas spirit that Michael Bublé sings about. I had the time to actually enjoy the Holidays, to share the values of Christmas with my loved ones. Since then a lot has changed. I think you know what I mean, if you are trying the impossible, by being a working women and a housewife at the same time. Christmas and December brings madness to our life. We already cope with a lot during the year. And Christmas just adds more tasks to our long to-do list. Why am I so negative? I just have to look back at my last Christmas. I was sitting in the office until the 23rd, only had time to buy and wrap the presents the very-very last minute. The only quality time I had lasted only an hour, when on the 24th I quickly prepared some cookies for the family. I promised myself that next year would be very different. This year I want change. I want to do it differently. For myself and for my family. This year I'm determined to fully enjoy the Holidays despite the annual gift shopping and workload at the office and at home as well. For all of this, I got some extra help as Lidl is by my and by every woman’s side this year. Our mission is to make Christmas less stressful so that it becomes what it was supposed to be – a peaceful time. To get a hint, check their lovely Christmas campaign HERE! 1/ Christmas is not only about the 24th, so I'm trying to focus on the Advent period as well. I started the tuning from the very first days of December. As a result I'm already halfway with my gift list and my apartment is almost Christmas ready. When do I find time? I work like crazy during the week but my weekends are devoted only to the preparation. 2/ I'm focusing more on myself. I'm not saying that you should be selfish. I'm only suggesting that if you help yourself gain some serenity then you can more easily adopt to the Christmas spirit. I know that the most difficult is to find the time but you know we have that saying: "There is always time if you make it." 3/ I'm having my family by my side with whom I can share not only Christmas Eve, but the whole December. I'm trying to spend more time with my loved ones and involve them in my Christmas preparation. As a start of our collaboration with Lidl, I prepared my ultimate Christmas jolly-joker, the butter cookies for you. I wanted to add some speciality to my Christmas menu (which actually coordinates well with the colour of my Christmas tree) so upgraded it and tried its matcha (aka green tea) version. Whilst preparing the recipe I strictly followed my above laid rules as (1) I prepared it on Friday night to let the steam off after a stressful week at the office (2) I was alone as Miki was out so I had the whole apartment to myself so I could mingle with the ganache filling until midnight (3) As my cookies turned out irresistible, I invited over my mother and we prepared a second portion with her on Saturday. They look so beautiful, aren't they? And believe me, they are also tasting heavenly as well! 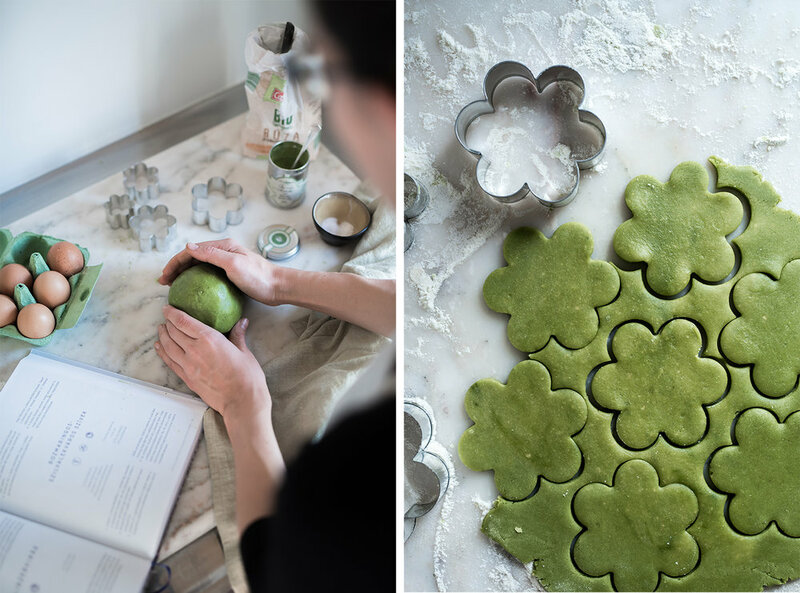 So don't procrastinate your Christmas preparation, follow my example, lay down your own Holiday rules, get the ingredients, pick a Christmas playlist and prepare some matcha butter cookies. Just remember Lidl's message, no hassle this year, this Christmas is yours so enjoy it to every bit. For the cookies, mix together the ingredients. Let it rest half an hour, wrapped in plastic, in the fridge. Roll on a lightly floured surface to about 4 milimeters thick. Cut out shapes with a cookie cutter and place on a baking sheet lined with baking paper. Bake at 175° C for 9 minutes or until they are still pale (not yet golden) but dry to the touch. Remove from the oven and let cool on the tray before moving to a cooling rack. In the meantime, make the ganache. Put the finely chopped chocolate in a small bowl. Heat the whipping cream in a saucepan until boiling. Pour it over the chocolate and let stand for 30 seconds. Stir with a small spoon until chocolate is melted and ganache is smooth. Leave to cool and then have it rest half an hour in the fridge until slightly thickened (it won’t thicken a lot though). Turn the cookies upside down and slather the ganache on them. Stick them together, dust them with powdered sugar and finally put a tablespoon of jam in the middle.